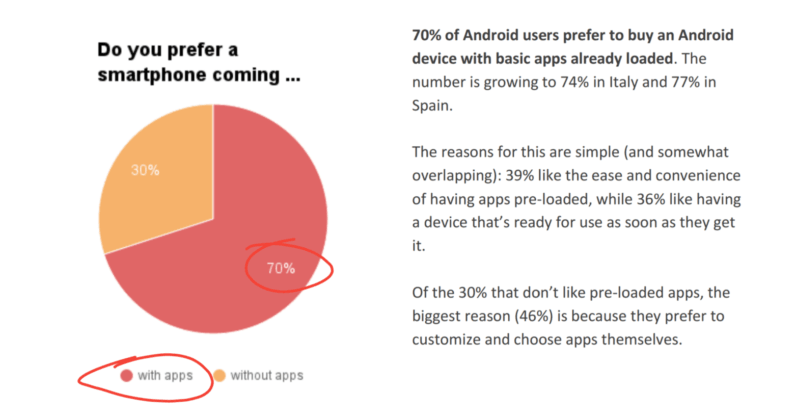 A new study suggests that 70 percent of European Android users want pre-installed apps. No, it is not opposite day. The Application Developers Alliance asked 4,000 Android users in France, Germany, Spain and Italy about their app install preferences. It’s worth noting that Google helped develop the study, and the company is currently locked in battle with the EU over whether its default Android apps are anti-competitive. The results seem to lie in Google’s favor. The vast majority of Android users change their home screen setup (90 percent), and that while Google apps were generally within the top few apps used, they were rarely #1. For Shopping, it was Amazon. For music, it was Spotify. For chatting, it was WhatsApp. For calls, it was Skype. For reading, it was Kindle. The categories it led were streaming video (YouTube), email (Gmail), and Cloud storage (Drive), and finding flights (Google Search), none of which are particularly surprising. The “works out of the box” part is a shady bit of wording; of course you want your phone to work. As phrased, it seems that your phone wouldn’t work without these apps, while so long as you have access to an App Store, you’ll probably be fine. The survey also does not delve into more subtle questions. For example, users might prefer to have access to various different app stores. Alternatively, they might be fine only having access to the Google Play Store, but would rather their phones not include specific services like Play Music or Movies, let alone most carrier-installed apps. On the other hand, for many people, that extra hassle isn’t worth it, and might even be intimidating. Having pre-installed apps gives you things to play around with when you get a new phone. There are many arguments against pre-installed apps, but truth is it boils down to which specific apps are included. And while you could also point out that having pre-installed apps in general might slow down devices, but as far as the anti-competitive litigation goes, the study does corroborate Google’s claim that pre-loading its apps doesn’t stop people from using others.